If you seek to break a rock, many types of stone have a crystal structure which create fracture planes: hit the rock in the right place and it drops into two; hit it in the wrong direction and it just chips. When you attempt to categorise stuff into two or more types, if division comes easily and is clear to everyone then you have found a categorisation which reveals something about the underlying nature of the information. If it is hard to do and the results are messy and debatable, then you are trying to force an unnatural taxonomy onto the data. Look at how we deal with responses in "classical" IT Service Management. By Responses I mean Request, Incident, Problem, Change, Event.... any "ticket" which requires a human response. If you read the ITIL books or just about any other body of work on ITSM, it talks about following a process for dealing with the response, and that process coming from predefined models of how to deal with them. if we encounter an unknown "exception" condition, most guidance gets vague: it turns into a fuzzy cloud that says "resolve it". Problem Management is an area where almost every "ticket" is a previously unknown condition, so Problem Management guidance tends to have more information about dealing with un-defined situations, but the guidance is still generally vague outside of some formalism around root cause analysis. [Business Process Modelling] and [Adaptive Case Management] are useful for different kinds of business situations. Highly predictable and highly repeatable business situations are best supported with BPM. For example signing up for cell phone service: it happens thousands of times a day, and the process is essentially fixed. Unpredictable and unrepeatable business situations are best handled with ACM. For example investigation of a crime will require following up on various clues, down various paths, which are not predictable before hand. The are various tests and procedures to use, but they will be called only when needed. Case Management is about managing "cases", where each new situation must be dealt with differently. Cases are dealt with by knowledge workers, known here as case workers. Examples are medical, crime, legal, social work, audits, emergency responses, military attacks ... or many IT requests, incidents, problems and changes that don't fit a standard model. I'm moving away from process-oriented approaches in general, hence Tipu's informality. Now I understand why. The natural split in user "tickets" is Standard vs Case. Current ITSM theory is good on dealing with the stuff we know about, the pre-defined standardised responses. It is not so good on dealing with unfamiliar or unknown situations: that is why we need to bring in Case Management thinking. But first a bit more about what Case management is. A case is a situation to be dealt with, e.g a medical case, a legal case, a traffic accident, a crime. Because process is loose or undefined, good policy is essential, to define the principles, rules, bounds and guidelines. Data is central. Case is driven by data, with process secondary (the opposite of BPM). Enterprise architecture as input to Case is required, to model business (markets, channels, partners...), organisation, capabilities, processes, IT. There is an Adaptive Case Management movement within the IT community. Case Management is "Adaptive" when the ACM system changes in response to the external environment to make Case Management more successful. E.g. learning from past cases to improve stored knowledge, templates, checklists or procedures. Some of this section draws from the ideas in Mastering the Unpredictable . In addition to talking about Case, we also need to discuss Standard Models, before we put them together to make Standard+Case. ITIL talks about Models for dealing with Requests (SO2011 4.3.4.2, 4.3.5.7) and Incidents (SO2011 4.2.4.2) and Changes (ST2011 4.2.4.5), and even Problems (SO2011 4.4.4.2) though these will be rare. Since Event Management is a process, I think you can have Event models too, though ITIL doesn't explicitly mention them. ITIL also talks about Incident models and some Change models being Standard. In the case of Change, Standard means pre-approved but the bit we care about is that it is well understood and repeatable. fully documented and tested: this is the "standard" bit. [Most of all] unambiguously defined. Before you open the standard door, it has to be agreed and clear what constitutes that type of activity... and what doesn't. Case Management talks about "templates" as guides to how to resolve a case. These can be thought of as partial models, or models that have not yet been standardised. We could call templates "non-standard models", or stick with the ACM terminology of "templates". What do you think?. Case tickets present an unknown or unfamiliar situation. They rely on the knowledge, skills and professionalism of the person dealing with them. They are best dealt with by ACM, being knowledge-driven and empowering the operator to decide on suitable approaches, tools, procedures and process fragments. Note: ITIL and Lean do fit this S+C paradigm, if you use them in the right situation: Standard responses. S+C extends them with better tools for non-Standard cases: ACM, Kanban, Knowledge Centered Support(KCS)... Better still, this S+C approach might let the ITIL and anti-ITIL camps live in peace and harmony at last. Here is a PDF white paper about how S+C fits with the Cynefin situational model. Emergent: the plan and workflow unfold as the case goes along. A plan may not see to the end, and it will certainly evolve as new data comes to light. This isn't about abandoning the "ITIL" processes: request fulfilment, incident management, problem management, change management. The only part of the process that Case will replace is the Resolution step. See the diagram: is there a standard model for responding to this ticket? If yes, then it is a Standard ticket. If no, then we need to use Case to resolve it. Standard+Case is about having little or no process for the Resolve step in Case tickets (so I used a fuzzy cloud not a process box), and otherwise process is pretty much unchanged. There are any number of procedures we can use as resources and assemble as needed during Resolve. Some of those procedures one might glorify with the title of "sub-process" but I don't like that term when there is no parent process. And there is no parent process for the Resolve step. The case changes state in response to information uncovered and external events, and actions taken. This is unpredictable. It's not a new way of working: good knowledge workers resort to case management to deal with "hard" tickets already. But S+C formalises the non-process-driven "exceptions" into a methodology and defines rules around who and when. The "adaptive" part of ACM is supported by our existing ITSM improvement processes, where present. Cases should be reviewed for improvements to all the Case resources, especially the templates/models and the knowledgebase. Service desks have always struggled to offer challenges and growth to professional SD analysts. Gamification is a cool new solution to that issue. Only the most senior, Case-certified staff members (those who have "leveled up": gamification) get to do Case Management, to deal with non-standard tickets. Now the SD Analyst is not faced with the prospect of resetting passwords or adding people to Active Directory groups for the rest of their lives. And the new guy doesn't get tossed into the deep end of coordinating techs and knowledge to resolve tricky cases. frontline employees are give 0 power to do anything and told to resist anything other than the normal procedure. Requiring you the customer to get angry and ask for a supervisor who has the ability to do what you want. Customers frequently have requests that are outside of the box. Some really can't be solved ... but some... easily can. My issue is with companies ...failing to serve their customers because of minor obstacles. Standard+Case says that sufficiently skilled and experienced staff should be pre-approved to treat non-standard tickets as a Case (to work out how to solve it based on the situation at hand), whilst providing them with good tools, access to knowledge, and clear policies and guidelines. That's empowerment. 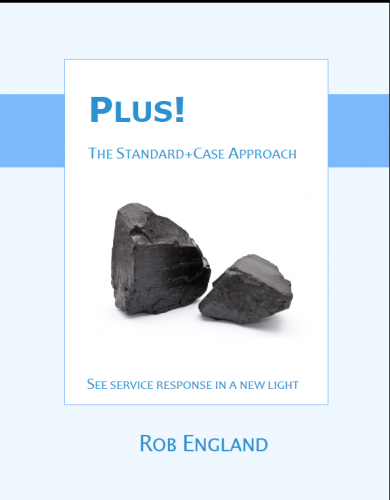 Standard+Case creates a self-adapting system so that process stays current with some of the changes in our environment by creating and capturing new workflows for new types of ticket, e.g provisioning users to a previously unknown system, resetting a new type of handheld device. We standardise our process models for various ticket types. As the world changes, suddenly we get exceptions. 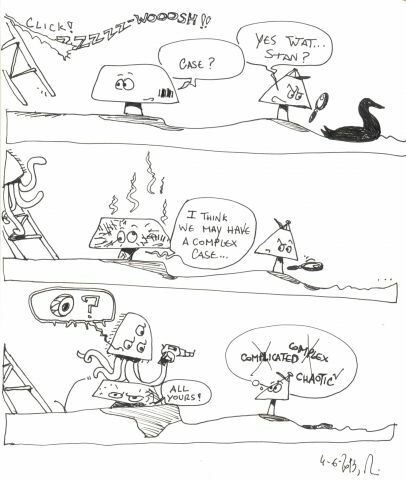 Case management deals with the exceptions. The review process captures repeat exceptions and creates standardised process models which we feed back into the knowledgebase. So now we can build a picture of what we need to do and have in order to perform Case Management in the context of service management responses, i.e. the case-oriented half of the Standard+Case approach. 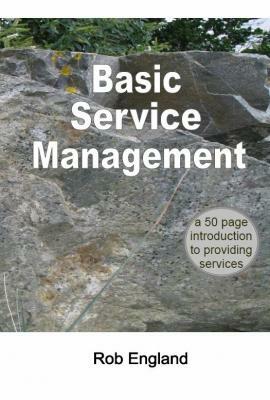 Let's call that Service Response Case Management (SRCM). Policy (principles, rules , bounds). This is #1, and is huge. If you empower people you MUST give them rules and bounds. Great analogy from Mastering the Unpredictable: hard rules are the guard-rails on the road, soft rules are the painted white lines. The system should enforce as many of the hard rules as possible, but only warn on soft rules. Standard and Case ticket tracking must be integral, one tool. Case is a branch, not an independent system. See Process. Value and study diversity of approach. templates: standard tasks, documents we expect to see, data we want. checklists of tasks and other deliverables: the flow may vary but there are often sets of outputs we require before the case is done. These resources should embed policy rules, guidelines and bounds (business, legal, marketing, CRM...). They need access controls and audit trails to mitigate the freedom we give the case workers. Review and improve knowledge. KCS has useful concepts here for rating knowledge and counting usage. Checklists will play an essential part in making sure we know what must, should, or could happen before the case is over, and must, should or could be input or output. Hence the MoSCoW technique will also be used. 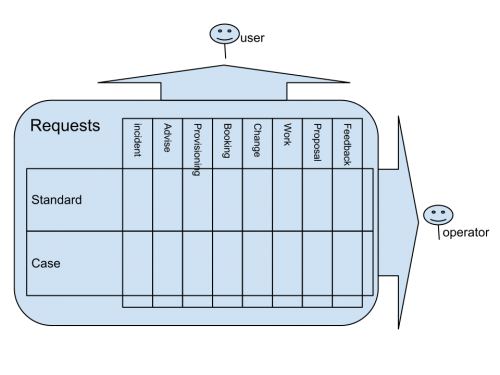 Kanban for managing case workload??? Case is about the approach people use, not the tools. Don't seek a technical fix to a non-technical requirement. Current tools will often be good enough. Advanced Case Management, rather than being a new technology, is actually just a new way of thinking about how the technology we use integrates with the services we provide. I dislike one aspect of the Mastering the Unpredictable book: it paints an idealised tool nirvana as an essential condition for successful Case. I don't buy it. I'm not going to decline to adopt a better way because my tool doesn't support it. I'll either (a) use the current too for managing requests and branch to a different tool for the Case Management bit or (b) find a way to manage Cases in the existing tool even if it wasn't designed for it and extend it where necessary or (c) set the vendors salivating by looking for a new tool with both Case and BPM capabilities. Can anyone suggest ticketing tools that have dynamic user-configured workflow, and powerful unstructured KM? I don't think you will find many of those. Don't over-invest in trying to create one until the ACM practice is mature. I believe ITIL's Incident vs Request is not a useful categorisation of user service. I argued long ago on the IT Skeptic blog that Incident vs Request is wrong. To me an Incident is a sub-type of Request (along with a dozen or so other sub-types). This is not a natural fracture line. We don't need to debate here whether I'm right or not in that assertion: it is an example of where I think something doesn't split cleanly and is in fact distracting us from the best way to split service desk response (as an example of responses). Even if you want to maintain the Incident-Request division, Standard+Case is useful and important to you. Responses are a generic entity type which is further broken down into types of response, which are child objects inheriting properties of the parent. Incident is one type of Response, not a totally separate "bucket"
ITIL says all requests should have a model (although it also says "some" in places). S+C says only Standard requests do. Any one of the classes of Response that we use in order to decide WHAT action is required, can then be categorised by HOW we are going to deal with it: Standard process or Case management. For example many Provisioning (Access) requests will be Standard, but occasionally they will be unusual and need to be dealt with as a Case. Conversely perhaps fewer requests for Help will be Standard, and many will need individual attention as a Case.